After many requests from customers, Lucas Oil Products is introducing the new Lucas Oil Parts Cleaner & Degreaser. The product is made with advanced Polyetheramine (PEA) detergents to help clean and degrease carburetors, chokes, brake calipers, rotors, air intakes, throttle bodies and unpainted metal parts. Lucas Oil’s Parts Cleaner & Degreaser is available in an aerosol can for ease of application, contains no CFCs, and is 50 state VOC compliant. 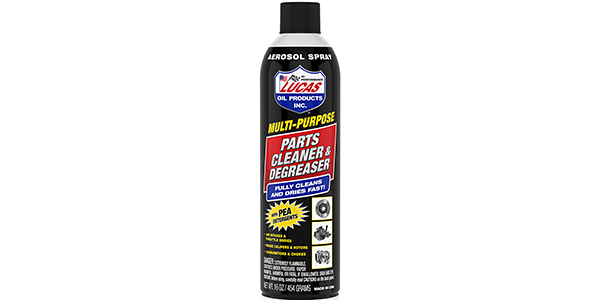 Lucas Oil Products’ new Parts Cleaner & Degreaser with PEA detergents is the perfect multi-purpose automotive cleaner and degreaser for your garage or shop. Formulated with advanced Polyetheramine (PEA) detergents to help clean and degrease carburetors, chokes, brake calipers, rotors, air intakes, throttle bodies, and unpainted metal parts.